Tinkering with New Materials in Udaipur — Wonderful Idea Co. 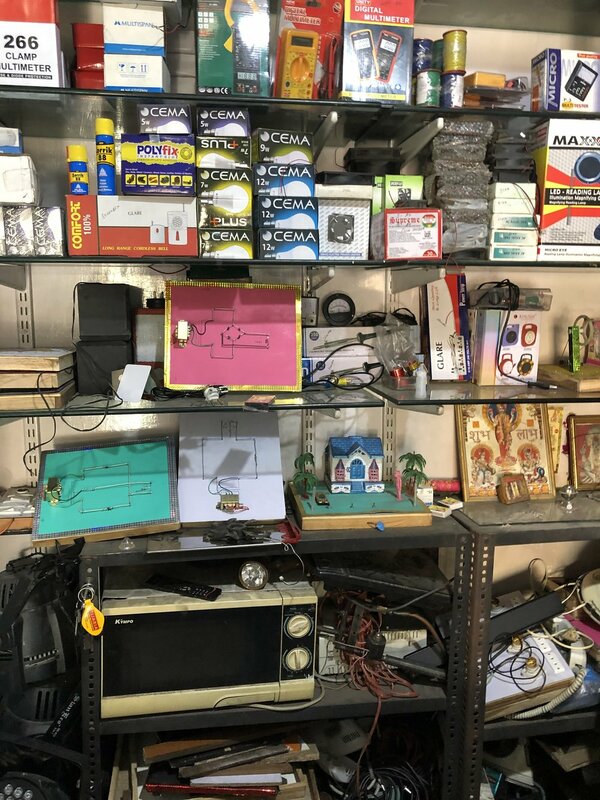 In the beginning of the year, I spent two weeks in Udaipur, India with the Dharohar team preparing tinkering workshops for kids and adults. It was super fun to experiment with different materials and learn about new ways of doing classic activities with locally available materials. The biggest difference was that we used bamboo pieces instead of wooden dowels. It was really interesting to use this more organic material. Some of the pieces were quite thin (better for uses like swinging flaps) and others were too thick for the pegs (but could be used for supports). Also the main track for marble machines in the Tinkering Studio is a shallow curved crown moulding. We like this one because it’s not too easy to use and allows for more tinkering and iteration. These pieces are usually hard to find in other countries so the team cut a thin PVC tube into thirds which worked perfectly as a tinkerable track. We cut the ramps into 6in, 12in and 18in long pieces. The team made some really incredible lights that had a final price tag of only $1.50 each (compared to about $15-20 for the usual lights that we use). They were all white, which actually results in a super interesting complex lightplay. The team got bags of these tiny super bright LEDs and connected with someone who could reassemble the flexible coolant hose parts (who even sent their kid to our three day youth workshop because he was interested in what he was making). This was a bit of a challenge. 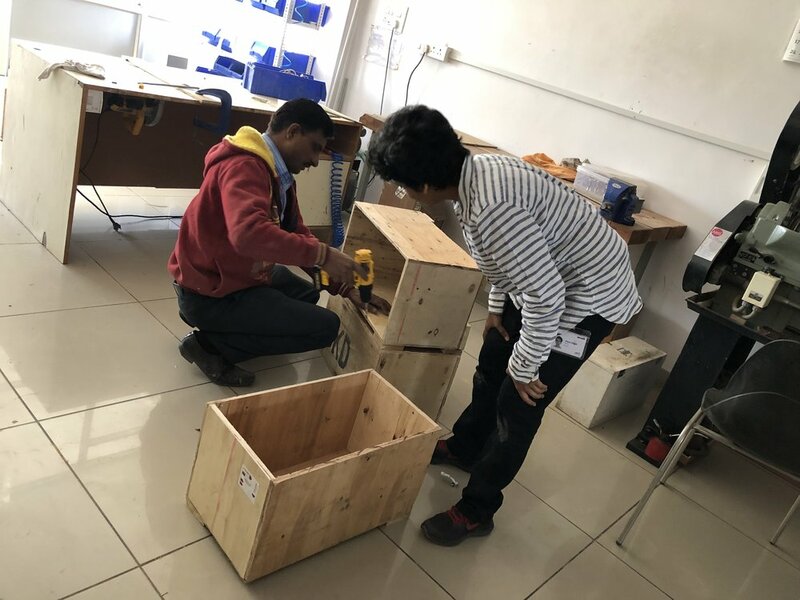 When using the method of cardboard boxes with opaque translucent screen we normally use HDPE but that was tough to find for the team in India. The first material wasn’t the best as it was too glossy and didn’t clearly transmit the light. After the first workshop we went searching for a replacement by bringing a light and some materials shopping with us. We tested out light play at the counter and found a thick transparency paper that worked a lot better than the original version. The fabrication team at Dharohar mounted yellow DAGU gear motors on wooden blocks with screw for alligator clip connections. These motors are really ubiquitous all around the world so it was good to test them for tinkering activities. They were great for chain reaction but were a bit too fast for light play event when only using one AA battery. It would be nice to see if we could figure out how to use a resistor or potentiometer to slow them down for the more contemplative activity in the future. It’s always fun to walk around the city and look for good materials for chain reaction and light play. In my short excursions I found some fun elements like plastic cricket bats, pull back tuk tuks and even side up pigeons. There are plenty of cool hardware, shiny fabric and kitchen elements that could be perfect for light play. One more special opportunity that I had was to go to the junkyard at Secure Meters to search for more tinkering materials. There was soo much good stuff! The best find were these broken gas meters that used linkages and gears to transfer energy, It was an awesome link to our automata experiments and we couldn’t resist turning one into a little face. We also used plastic scraps for linkages, injection mold waste for jitter bug bodies and component reels for chain reaction. For a fun environmental element, we also sanded down and removed the nails from wooden pallet boxes for scrappy material containers. There’s always something new to learn when tinkering in a different setting and I hope that this post inspired you to think differently about materials and experiment with what’s locally available.